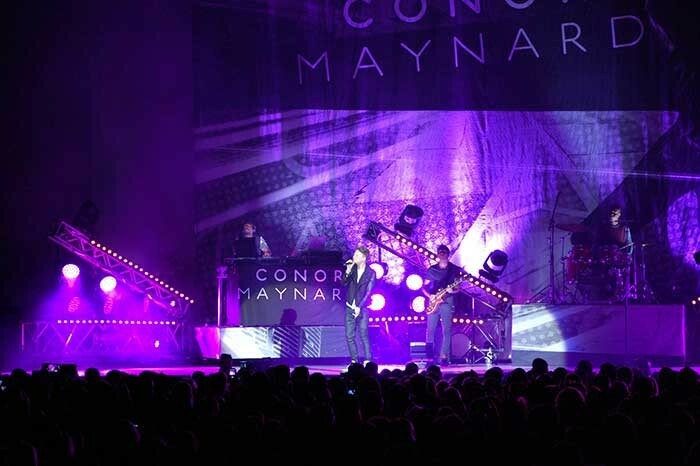 UK - Lighting rental specialist Siyan supplied a floor specials package for chart-topping British singer/songwriter Conor Maynard’s recent UK tour, where he opened for the dynamic Will.i.am. Maynard’s lighting designer Paul Smith from Edge of Blue Design wanted to make an impression, and so chose Robe Pointe and LEDWash 600 moving lights, among other fixtures to help achieve his goal. The project initially went out to quote, and he recalls that Siyan were the first company to come back with all their requirements at a good price so they didn’t have to start making substitutions to the kit! 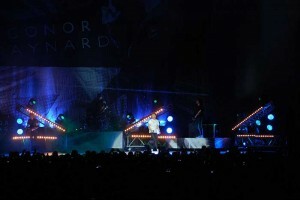 In this case and being the support act, time was absolutely of the essence in getting the rig on and off stage without holding up any other elements of the production. The innovative visual design for Will.i.am was also very projection orientated and as such there was not a massive amount of additional lighting kit available for the support act to use so touring a festival-style ‘specials’ set up provided an obvious solution. This also brought the additional advantage of being able to light Conor’s set and make him look individual and different without giving any of the game away! To maximise the small time-window available, Smith designed four chevron shapes using 2.5 metre sections of super-truss on wheels, complete with matching 30cm trusses clamped on top at an angle. In the void of the triangle he positioned the LEDWash 600s, 26 in total, with the eight Pointes on top of the four triangles. Smith loved The Pointes – it was the first chance that he had had to use them. LED truss toners were placed inside to give extra dimension, while Showtec Sunstrips outlined the shape of the chevrons, which together with six SGM Palco floods and four Atomic strobes were all run through a grandM2 light console. To ensure an expedient DMX footprint, all fixtures were run in minimal channel mode so the shutter channel on the LEDWash 600s dealt with some of the LED ring effects, which was very helpful. With only a 30 minute support slot, and a set list including all Conor’s biggest hits, the brief was to provide high impact lighting and the rig proved ideal for this. The Pointes were utilised both for back lighting and for audience gobo washes, with the LEDWashes doubling as washes and beam lights across the performance area. The flexibility and the intensity of the Pointes together with the quality of the focus really impressed Smith, plus the speedy frost, which proved great for chases. The incredible zoom range meant that the fixture could be an intense: a tight beamlight one minute and then transform into a hugely bright gobo effect the next, easily punching across the larger arenas like London’s O2.